Mia Dillon as Mrs. Ethel Banks and Jere Burns as Victor Velasco in Barefoot in the Park. . Photo by Jim Cox. Whenever the subject of comedy comes up in polite company it’s almost impossible not to include the name and career of America’s unchallenged King of comedy playwright Neil Simon. Simon is one of the world’s most successful and prolific playwrights. His stage play canon is huge, diverse, and wide-ranging when it came to subjects, characters, and stories. But he is best known for his comedy genius when it comes to the plight we humans find ourselves in during the short time we spend on this planet. Simon’s plays have always been relevant, and always will be. More theatre companies merely need to produce his plays which address the problems of how to navigate the choppy waters of getting along with one another. Simon offers the palliative of humor to ease the rough edges of dashed hope and dreams that slip through our fingers. Without humor and comedy; life would be unbearable. There’s humor everywhere just hiding in plain sight. Playwright Simon just helps us find it in his plays. But I digress. 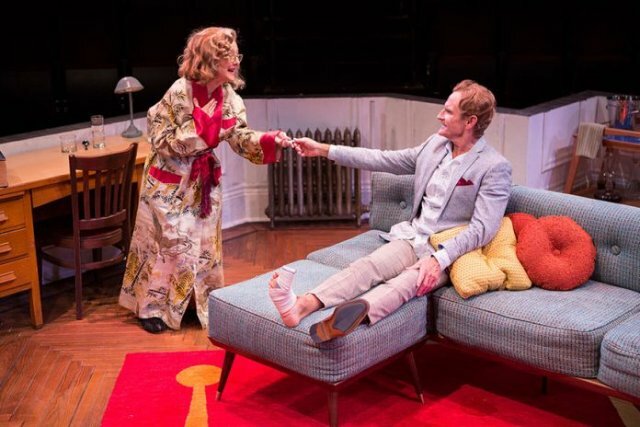 San Diego’s renowned Old Globe Theatre is currently staging one of Simons’ earlier, highly successful and blisteringly funny romantic comedy plays “Barefoot in the Park”; seamlessly and smartly directed by Jessica Stone. The story follows a pair of Newlyweds. Corrie and Paul Bratter, as they begin married life in a tiny, 5-story walk-up Brownstone apartment on the Upper East Side of Manhattan in February of 1963. Paul (terrifically played by Chris Lowell) is a strait-laced young attorney; Corrie (coquettishly and appealingly played by Kerry Bishe) is far more spontaneous and free-spirited individual who refers to her husband as a stuffed shirt from time to time. As the young couple contend with: a lack of heat, a skylight that leaks snow, several breath-challenging flights of stairs, an oddball Hungarian neighbor Victor Velasco (played with flair and elan by Jere Burns), and Corrie’s well-meaning mother Ethel Banks (nicely played by Mia Dillon) who lives in New Jersey, and an empathetic NYC telephone installer and repairman portrayed by Jake Millgard (in a little gem of a performance),along with the two newlyweds who must now reconcile their own personal differences in how they approach life’s challenges. Adjusting to married life isn’t so easy. Who knew marriage could be so complicated and yet so funny and entertaining at the same time? As always with the plays of Simon the situations and the dialogue is scintillating and replete what has now become known as “zingers”; a Simon trademark. The folly and the pathos on the part of Simon’s characters and their plight is what engages and connects the audience. Everyone can relate to the character’s antics as well as their own past experiences, say, in giving in to a request to dine at a place one normally wouldn’t. For example, when Paul, Corrie, Ethel, Corrie’s mother, as the guests of neighbor Victor Velasco, with all four dining at an Albanian restaurant on Staten Island consuming menu items recommended by Victor that are so esoteric that when consumed, they prompt Paul to comment “it’s not easy to dig into a black salad”, or enjoy “a sheep dip soup”, followed by numerous glasses of the Greek liquor Ouzu; which according to the characters in the play make ‘their teeth feel soft’. No one writes hilarious visual-like dialogue like Neil Simon. However, no more spoiler alerts from me. You must see for yourself this fresh, breezy, production to fully appreciate the great comedy writing of Neil Simon and the wondrous technical magic that the Old Globe creative team contributes in the apartment setting, along with five pitch-perfect performances by this outstanding cast. If I were to be picky about performances in this easy-to-like production, it would come in the form of a question: Why do young, but seasoned performers, think all young female characters – or their directors – feel the need for them to act like prancing, young fillies, to express youth when walking into a room? One should observe how real young people (18 to 22 years-old) act and move whether they’re living in 1963 or 2018. The technical credits are always first rate, state of the art, in all the venues of the Old Globe Conrad Prebys theatre complex. Led by director Stone, Scenic Designer Tobin Ost, renders a functional set with some visual surprises for the audience. Lighting Designer Amanda Zieve provides the proper amount of light to see the Costume designs of David Israel Reynoso, and Sound Designer Lindsay Jones completes the creative team. Director Stone, however, does indeed, mount a clever, fast-moving, wonderfully-paced comedy, that was originally written for a proscenium theatre, which she neatly transforms to fit into the in-the-round acting space of the Sheryl and Harvey White stage. It’s a splendid production. I am constantly amazed by Erna Finci Viterbi Artistic Director Barry Edelstein’s unerring play selections every season. He has the pulse of his patrons constantly on his personal radar screen as well as those of current events, and the needs of his actors and creative artists to stretch and grow. There is a backlog of artists waiting in line to become part of the Old Globe experience. How fortunate for San Diego audiences. “Barefoot in the Park”, performs in the Sheryl and Harvey White Theatre and runs through September 2, 2018. Posted courtesy of Desert Local News.